We are a small group of breeders, fanciers and exhibitors of the Golden Retriever. Recently we began the process of organizing a formal rescue group as there are a great number of Golden Retrievers that require our help. In the past we have rescued and placed dogs on an individual basis; however, the need is becoming far greater than the time, funds and ability of so few people. Rescuing dogs consists of many parts. We accept Golden Retrievers directly from owners who don't or can't care for them anymore; we acquire dogs from various pounds where they would otherwise be euthanized because their time at the shelter has run out; we will take dogs that are rescued from puppy mills; and we will take dogs that have simply been dumped. We are now appealing to you for help. The Golden Retriever is a gentle, elegant and extremely giving breed of dog. Unfortunately they are also one of the most popular breeds in North America making them also one of the most popular breeds used in puppy mills and ending up in shelters and Humane Societies. It is up to us to try to provide these dogs with a second chance. Please let us know if you can help.Foster homes, adoptive families, medical care, food, leashes, crates, pick-up and deliveries and most importantly financial aid is all urgently needed. Any donation will be gratefully accepted and will be used to vet, vaccinate, neuter and board any Golden Retriever given into our care. Please show us you care for this breed and contact us for further information. Most of the dogs that come through our program are homeless for a variety of reasons. They might have been abandoned, unwanted or rejected. Rescue is not a business. Its goal is not to make money but to re-home deserving dogs. Each dog is taken to a vet upon reception, evaluated by one of the rescue members and placed in a new home as soon as possible. Dogs come to us from different places. Sometimes they are dogs that have simply been found, lost or abandoned; some have run out of time at the shelter; and others come directly from their original owners who have decided they don't want/can't have a dog anymore. We try to collect as much information as possible on the dogs history, feeding schedule, exercise requirements and behaviour. We will not accept vicious dogs or dogs that might have bitten. A member of the rescue team collects the dog and takes it to a vet where the dog will be examined, vaccinated and neutered. From there the dog is placed in a foster home (if available) for further evaluation (temperament, behaviour, etc...) and then finally released to his new owners. Once a dog is taken into rescue there is no turning back. We try to proceed rapidly to minimize any stress to the dog. It's quite possible that a rescued dog will end up in his new permanent home within one week of receiving him. Under these conditions there can be no second thoughts. We try to ensure that we will not have to reclaim a dog that has been placed - but if things are not working out in the new home we insist that the dog be returned to us immediately. We do not want these dogs being transferred from one home to another. This type of scenario only leads to increased trauma and stress for the dog and may cause intensified behavioural problems. We, of the rescue team spend much time, energy and emotional commitment on each one of these dogs. All of this done completely on a voluntary basis and out of love for the breed. When you contact us we ask you many questions in order to verify whether or not you realize what will be involved with the adoption of a Golden Retriever in terms of time, energy and commitment. As wonderful as they are, Goldens are not for everyone. We want to make sure our dogs will have a home "for good'" We ask potential adopters to respond to a minimum of criteria. For example, we prefer our dogs to go to homes with a fenced in yard so that it will be a safe environment for it to run and play happily. If adopting one of our dogs interests you, contact one of our rescue members to give us your information and to set up an appointment to see what we might have available at that time. You can leave your name on our waiting list for any future rescue dogs that might be more suitable to your family situation. We are a non-profit organization, however, there are fees attach to adopting one of our rescue dogs. Those fees are due to the cost of vets bills. A $350 donation per dog is requested to cover our various expenses (vaccination, neutering, etc.) Upon request, you will receive a tax receipt for the amount exceeding the $350 donation or for any donation not related to an adoption. In the case of our older dogs (7 years and over), we will accept a donation in the amount of your choice and the total amount will be eligible for a tax receipt. For puppies who need more care, we ask for a $500 donation. All of our dogs are neutered to prevent them from contributing to the already over-flowing pet population. Once the dog his new home we try keep track of it. We like to make sure that the dog is adapting well to his new environment and that the new owners are happy with him. We also provide assistance and counseling when asked needed. It is impossible for us to guarantee against any future problems. We do our best to ensure that these dogs are in the best possible health. We do not hide any potential problem and we try to educate and inform the prospective owner of the presence of any known health disorders. Adopting a dog is for the dog's life time. Serious thought must be given before applying for one of our rescues. Are you interested in a Golden retriever? Contact-us! As already stated we rescue only Golden Retrievers. There are rescue groups for almost every breed of dog and others that do all-breed rescue. We have concentrated on Golden Retrievers simply because this is the breed that we love and are the most familiar with. They are usually easy going, lively, intelligent, extremely social (unless they've been traumatized with some sort of abuse) and more often that not they are 100% dedicated to their owners. They can be perfect family and companion dogs. The Golden Retriever originated in Scotland (Inverness Shire) where, Sir Dudley Marjoribanks, first Lord Tweedmouth created the breed in the 19th century. 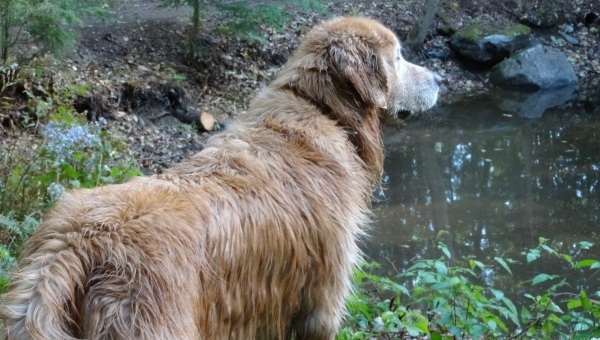 Goldens were bred to retrieve birds on land and in the water. The breed was accepted as purebred in 1903 in England. Goldens are VERY social dogs. They do not do well emotionally, behaviourally or physically when left alone for long hours. Often they will become destructive when neglected. It is this strong social characteristic that makes them such ideal companions. You basically become the center of their universe. 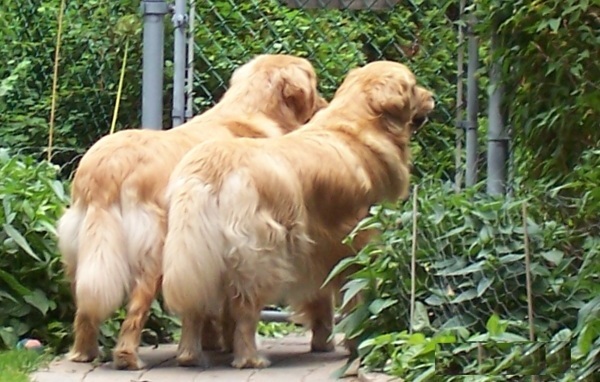 As with most breeds of dogs Goldens are pack animals and usually accept and adapt to other pack members with minimal trouble. However, as with any dog, they should NEVER been left alone with kids without supervision. They are large and can be quite rambunctious. We must know if you have cats as some of our rescues are known to not care for felines too much while others may have been raised in a house full of cats. Because they try to please they take well to training. Their easy-going temperament makes training fun even if it might require a little strength of both arm and will. They can forgive your errors and still look at you with adoration. In other words you can have good results with a common sense balance of discipline, gentleness, patience and tons of love. It's possible to have a Golden even if you work but you MUST make sure that he/she gets enough attention and exercise to compensate for those lonely hours. Goldens do not do well when left alone in the garage, basement or backyard. You would end up with an unhappy dog and an unhappy dog is trouble! Goldens tend not to be excessive barkers (unless left alone!) but they are good doorbell substitutes and will usually announce that someone is at your door.. Keep in mind that they were bred as game retrievers and due to this extremely strong inherent characteristic you should be able to have a general idea about their basic behaviour. The majority of Golden Retrievers will carry everything and anything that will fit into their mouths. If you leave things lying around don't expect to find them where you left them! Most Goldens have certain characteristics that might be a problem for some people. They are like children. They'll follow you around and demand attention, always waiting to please you. In exchange, for that unconditional love they give to you, they require fairness, compassion and dedication from you. The average Golden weighs about 35 kilos (75 lbs.) and can reach 55 cm (22 inches). They reach their full size at about one year old. Physically they will continue to mature until about 3-4 years old, mentally it might take a little longer. Usually they keep a lively, rambunctious nature until they are 5-6 years old (some people swear that its longer!). Goldens are known to be prone to a variety of genetically inherited problems. Many unscrupulous people have used the popularity of the breed to make money without paying any attention to genetics and the ultimate health of the dogs they are breeding. These people who have money as the goal for breeding dogs have become puppy-mills or backyard breeders. Eye problems; cataracts, retina atrophy, etc. In most cases, an adult dog will have shown symptoms of any serious levels of these health problems. When you adopt a Golden, you have to consider the time you'll need to care for him. Besides the daily exercise, you'll have to do the grooming. You should consider at least half an hour each week for a thorough brushing. This will also help reduce shedding and goodness knows that with all that long. thick, soft golden hair floating around ANY way to avoid even more of it is always a great help when cleaning the house. What to expect from a rescued Golden? Adopting a rescue dog is more than finding a new friend. It is also doing a good deed. Don't discount the possibility of adopting a rescue dog. They are waiting for you and are full of love for just the right person and the right home! There are advantages to adopting an adult dog. Most of the time, those dogs have had basic training. It's also easier to evaluate its behavior and his health condition more accurately. The destructive phase of puppyhood is almost over and you should be able to keep your furniture, toys and walls in one piece! On the other hand, the adult dog could may have acquired unwanted behaviors. But, keep in mind that a bad behavior can be corrected. However, new undesirable habits can be created if the dog does not get the necessary attention. We rescue only Golden Retrievers. They can be very good family dogs, very sweet and love to please. They are also very active and demanding and they shed! Although the breed in general is known as good family dogs some of our rescues may be too undisciplined for homes with small children, while others might be perfectly suited for that situation. We try very hard to pair or match our dogs up with the needs and capabilities of their prospective new owners. We cannot not forget that they are still are dogs and as such, they need care and supervision. The rescued dog usually comes from a households that for one reason or another decides they are unable to keep the dog. Some of those dog might have been abused, some neglected, some are undisciplined and other might have been treated like a human child or a member of the family. We can never predict when or how many dogs we might have at any time, and we rarely receive small puppies. ALL of the Goldens we receive are taken to a vet, neutered, vaccinated and evaluated by to the best of the rescue teams capabilities. We are looking for PERMANENT homes for those dogs. can never say it enough; to adopt a dog is to make a commitment to it for its whole life-time. A rescued Golden is a great companion who will join you in many of your activities. We refuse all known aggressive dogs and dogs who, to the best of our knowledge, may have bitten someone. Naturally, it is difficult to determine just how a dog will react in new situations and environments. It will require a few weeks in his/her new home for the dog and his new owners to adapt and get to know each other. We always inform the prospective owners of whatever problems we know that the dog might have in order to facilitate the prospective owners decision making process. This information may also help the new owners and our dogs settle in and begin the bonding process. 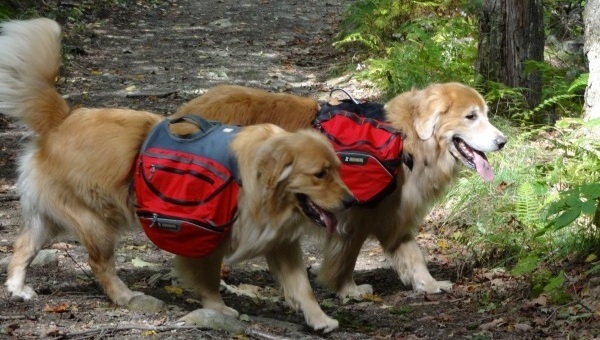 These dogs are most often from unknown genetic backgrounds so it is impossible for the Golden Retriever rescue of Quebec to guarantee the absence of hereditary or congenital diseases. We can only ensure that the dogs are in good general health. We will notify all prospective owners of any known health or behaviour problems in any of our dogs prior to adoption. 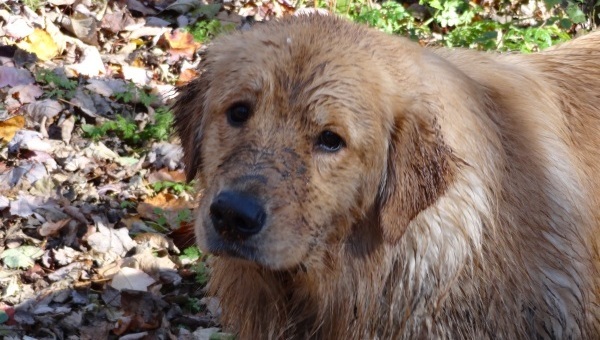 Do you really, REALLY want a Golden Retriever? Voulez-vous VRAIMENT un Golden Retriever? To Breed Or Not To Breed - That is the Question! Faire ou ne pas faire la reproduction - Telle est la question!